We have published an article relating ICS for Windows 98. This article briefly introduces ICS for Windows Vista, however, the procedure can be, with some slight changes, applied on Windows XP, as well. ICS substitutes a router which is usually described as an HW solution consisting of a network element which connects entire networks to internet. In large networks, the HW solution can be replaced with a SW solution, e.g. MS ISA Server or Kerio WinRoute Firewall, providing advanced security and monitoring features. ICS is an ideal solution for home or other small networks where one computer is able to provide almost immediate access to internet and other computers. The service works as a DHCP server (assigns TCP/IP configuration), NAT (internet access) and DNS (translates domain names into IP addresses). Our computer has two network cards - one set up for internet connection and the other one unconfigured. 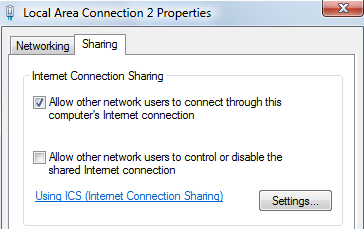 Open Properties of the network connection with configured internet connection (network card with internet connection you want to share). On the Sharing pane, tick "Allow other network users to connect through this computer's connection". Second network connection (with connection to another computer or computers) does not need any setup. Static IP address 192.168.0.1 and the Mask 255.255.255.0 are automatically assigned. In order to connect just one computer, you will probably need a crossover cable. For more computers, you will need a switch (crossover cables are not necessary). When configuring the TCP/IP protocol for the network adapter, leave the following option ticked - "Obtain an IP address automatically"
The connection for the second computer does not work if the main computer is turned off. The main computer must be on and ICS must work properly, and the network connection on clients must be correctly set up and working. If you turn computers off and want to turn them on again, first turn on the computer with ICS so that it assigns the TCP/IP configuration on startup of the other computers. Sharing can be applied on various connections. Usually, dial-up modem connection or network connections via WiFi devices or routers are shared. It is not recommended that you use ICS in domain environment (there is usually no reason for that).